An exciting recent development is an ability to provide hearing to some bilaterally deafened individuals through implantation of a device which directly stimulates the hearing nerve (actually the spiral ganglion). Although this device is not generally considered as a "hearing aid", it performs the same purpose for individuals with severe hearing impairment involving both ears. At the time of writing of this section, there are three companies that make implants -- Advanced Bionics, Med-El, and Cochlear Ltd. Generally an electrode is threaded into the cochlea, often via the round window. Cochlear implants do not completely substitute for a normally hearing ear,and at very best, may allow someone who was previously totally deaf to understand conversation on a telephone. Cochlear implant packages, including the device, surgery, and rehabilitation are much more expensive than hearing aids (roughly $45,000), but when one is indicated, they are sometimes covered by insurance, unlike the usual situation with hearing aids. Music appreciation is not at all normal after CI, but rather patients with CI "Patients with CIs had difficulty with pitch and timbre perception. " (Riley et al, 2018). In other words, the classical pianists who is going deaf will probably not regain normal musical abilities after a CI. With respect to cost-effectiveness of cochlear implants, Lammers et al (2011) reported that it varies widely, and more data is needed to come to a firm conclusion. This doesn't speak very well for the cost effectiveness of implants -- if they were very effective, there would be no quibbling. Our observations is that cochlear implants in the US are generally found in persons with special financial resources -- they may be very wealthy, they may very well insured, or they are indigent, perhaps on Medicaid, and the cost is paid by government programs. Obviously, the great majority of people in the middle are left out. A patient-contributed history is found here. Remarkable improvements in performance have been accomplished since 1980. Cochlear implants	are very expensive devices, that are often paid for by health insurance. Having more cochlear implants done benefits patients, surgeons, and CI manufacturors. It adds to the cost of health care, and generally very little attention is paid to the cost/benefit ratio of a CI. As of 2017, insurance would pay for most CI if both ears are very deaf. Having insurance pay for a CI is called "indicated". Unless one is independently wealthy, one wants one's cochlear implant to be "indicated" so that insurance will cover the extremely high cost. At the present writing (2018), this means that one should be "unaidable" -- meaning that hearing aids do not provide sufficient hearing to understand speech. Roughly speaking, "unaidable" is assessed by the 50-50 rule -- more than 50db down, and less than 50% word recognition. Most people are worse than this -- they are 70 dB down in each ear. "The Centers for Medicare and Medicaid Services (CMS) has determined the following: The evidence is adequate to conclude that cochlear implantation is reasonable and necessary for treatment of bilateral pre-or-postlinguistic, sensorineural, moderate-to-profound hearing loss in individuals who demonstrate limited benefit from amplification. Limited benefit from amplification is defined by test scores of ≤ 40% correct in the best-aided listening condition on tape recorded tests of open-set sentence cognition." We think Medicare made a typographical error here - -the word "cognition" should be something else -- perhaps completion, as we don't think that one can measure "cognition". The very high initial cost of these devices (similar to the very high cost for some types of cancer chemotherapy), combined with the limited benefit of these devices (i.e. it is wonderful to hear again, but no lives are saved here), makes for some interesting ethical issues, as well as interesting insurance situations. One might wonder -- if there is a fixed amount of monetary resources for health care, should a given $50,000 be spent on a cochlear implant, or on HIV medication ? Or perhaps on nursing home care ? Again, no lives are saved by cochlear implants. There could certainly be huge differences of opinions, in a world where health care benefits are rationed. Regarding interesting insurance situations, suppose that an individual who could not afford an insurance that would pay for a CI, were "helped out" through a charitable program, or perhaps even a health care facility, that bought them insurance, which could then be used to purchase an implant. The patient, health care facility and device providers all benefit, but the insurance company might be unenthused with this tactic. Another "loophole" here is that assessing speech recognition problems that might indicate a CI requires cooperation. One could imagine that an individual, hoping that their CI will be indicated, might not cooperate fully with a hearing test. In other words, the 40% speech recognition criterion is vulnerable to persons who might gain from fraud. Of course, the benefit to society in terms of years of hearing, is potentally much greater when a 2 year old is implanted compared to a 98 year old. Generally speaking however, this computation is not made, perhaps due to a distaste for putting limits on health care spending. Often it is pointed out that if healthcare costs are not allowed to grow with out limit, people will die. The author of this page does not argue with this assertion, but it doesn't seem reasonable to let anything grow without limit. One might also ask the question as to whether or not CIs work as well in the old as in the young. One would expect that the young would do better. Strangely enough then, Garcia-Iza et al (2018) recently reported that "This study shows that cochlear implantation in the elderly is as safe, useful, and worthwhile as in young adults.". So at least from these data, it seems that CI "work" in the elderly, although there are presumably less years to enjoy them as in the very young. An ossified cochlea is one that is obliterated by bone. One would not think that people who have bone replacing the channels in their cochlea would be very good candidates for CI, as there should be no way to get the electrode into the chunk of bone that has replaced the inner ear. As one would expect, CI does not work as well in persons with ossified cochleas (Yan et al, 2018). Bilateral vs. Unilateral Cochlear Implants. Our thought on this is that it is generally a bad idea to have bilateral implants. Our logic goes like this. The benefit of converting from completely deaf, to hearing with one ear only, is gigantic. The benefit of going from hearing with one ear only, to hearing with both ears is small. There are far better uses for health care money than spending a very large amount of money on a small benefit. One can spend money on saving more lives (e.g. heart attacks or cancer) as an example. Another argument is that while the benefit of two implants is relatively small, the risk of doing two implants doubles. One has twice the risk of infection, of dizziness, etc. Thus, one might also question whether someone who has lots of spare cash, and who is deaf on both sides, should reasonably purchase a second CI. 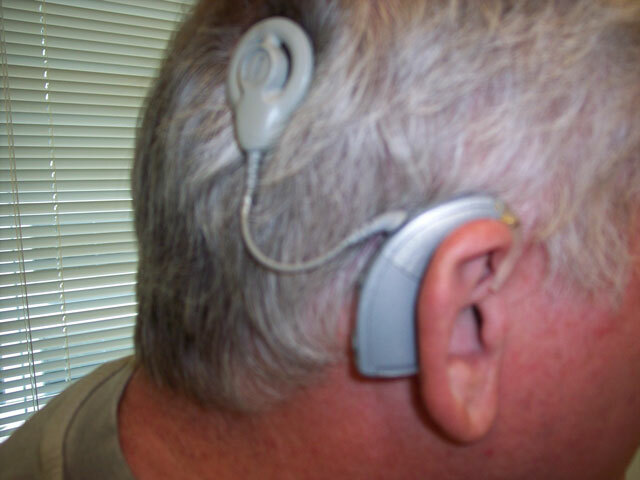 There has been a trend towards cochlear implants being used in people who are not "unaidable". For example, persons who have one implant already seeking a second implant. In Germany, implants have been used for single-sided deafness -- i.e. people with good hearing on one ear (Jacob et al, 2011). Results are reported to show "advantages" over alternatives such as CROS and bone implants such as the BAHA (Arndt et al, 2017). We are dubious that the cost/benefit ratio of a cochlear implant for single sided deafness is reasonable: In general, the costs of implants are very high, and the benefits of implants in SSD are low, and in our opinion, medical/social resources would be better spent elsewhere. In other words, we don't think that government funding should be paying for these devices in people who have good hearing in one ear. We are especially concerned about the potential for abuse where there are mandates about "coverage", and subsidies for insurance. This seems to us to be a sneaky way of forcing the public to pay for a a very expensive treatment with relatively little benefit. Of course, the independently wealthy are in another category and they can do whatever they want as long as they are paying for it themselves. Fortunately, the potential market is small. We also think that the BAHA device or the CROS hearing aid for unilateral deafness is a far better choice than a cochlear implant as it is not nearly as invasive. We do not think that the devices that cost one or two orders of magnitude differently, should be put on a "level playing field" with respect to cost. There should always be consideration of cost and benefit. Cochlear implants sometimes have complications. Dodson reported a 9.3% overall complication rate, with 59% being due to device failure (Dodson et al, 2007). The implant may end up in the wrong part of the ear -- in the scala vestibuli rather than scala tympani. The implant may end up "folding over" -- this happens in roughly 2%. Then two sets of electrodes map to the same spot in the cochlea. Meningitis is a rare but serious complication. Hearing may continue to deteriorate after the implant is inserted(Barbara et al. 2003), perhaps due to scarring or nerve degeneration. CSF leaks are also complication, usually around the receiver/stimulator recess (Dodson et al, 2007). These are treated by operative repair. Cochlear implants are VERY costly. Vertigo post cochlear implant is common. We have a separate discussion of this problem here. The BAHA (bone attached hearing aid) is an excellent implantable device for persons who have either primarily a conductive hearing loss or good hearing on the opposite ear. There are several other similar devices. There is also a device that is implanted into the middle ear, in essence, implanting the speaker part of the hearing aid. This device, the Symphonix Vibrant Soundbridge, is mainly used for individuals who are unable to tolerate conventional hearing aids. It avoids the "occlusion" effect and feedback. These devices often have mechanical problems. The Vibrant Soundbridge is now available in the US through MED-EL Corporation. The auditory brainstem implant (ABI) is mainly used for people with "nerve" deafness, such as persons with neurofibromatosis. It provides sound quality similar to a single-channel cochlear implant (i.e. sound awareness, but not speech comprehension). 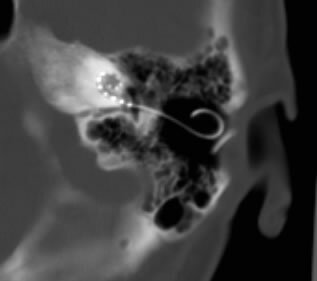 Cochlear implants with removable magnets are approved for patients undergoing MRI at 1.5 Tesla after magnet removal. The MED-EL PULSAR, SONATA, CONCERT, and CONCERT PIN cochlear implants can be used in patients undergoing MRI at 1.5 Tesla with application of a protective bandage. The MED-EL COMBI 40+ can be used in 0.2-Tesla MR systems. Implants made from nonmagnetic and nonconducting materials are MR Safe. Azadarmaki R1, Tubbs R, Chen DA, Shellock FG.MRI information for commonly used otologic implants: review and update.Otolaryngol Head Neck Surg. 2014 Apr;150(4):512-9. doi: 10.1177/0194599813518306. Epub 2014 Jan 7. Barbara M, Mattioni A, Monini S, Chiappini I, Ronchetti F, Ballantyne D, Mancini P and Filipo R (2003). "Delayed loss of residual hearing in Clarion cochlear implant users." J Laryngol Otol 117(11): 850-3. Dodson, K. M., P. G. Maiberger, et al. (2007). "Intracranial complications of cochlear implantation." Otol Neurotol 28(4): 459-62. Garcia-Iza L, Martinez 2, Ugarte A, Fernandez M, Altuna X2.Cochlear implantation in the elderly: outcomes, long-term evolution, and predictive factors. Eur Arch Otorhinolaryngol. 2018 Apr;275(4):913-922. doi: 10.1007/s00405-018-4910-y. Epub 2018 Feb 26. Harris, J. P., Low, N. C., & House, W. F. (1985). Contralateral hearing loss following inner ear injury: sympathetic cochleolabyrinthitis? Am J Otol, 6(5), 371-377. Jacob R, Stelzig Y, Nopp P, Schleich P. [Epub ahead of print] [Audiological results with cochlear implants for single-sided deafness.] [Article in German] HNO. 2011 Apr 30. Krause E, Wechtenbruch J, Rader T, Berghaus A, Gürkov R. Impaired fixation suppression is a risk factor for vertigo after cochlear implantation. Laryngol Otol. 2009 Feb 26:1-6. Lammers MJ, Grolman W, Smulders YE, Rovers MM. The Cost-utility of bilateral cochlear implantation: A Systematic Review. Laryngoscope. 2011 Dec;121(12):2604-9. doi: 10.1002/lary.22387. Migirov, L., Taitelbaum-Swead, R., Hildesheimer, M., & Kronenberg, J. (2006). Revision surgeries in cochlear implant patients: a review of 45 cases. Eur Arch Otorhinolaryngol. Riley PE, Ruhl DS, Camacho M, Tolisano AM..Music Appreciation after Cochlear Implantation in Adult Patients: A Systematic Review. Otolaryngol Head Neck Surg. 2018 Feb 1:194599818760559. doi: 10.1177/0194599818760559. Todt I, et al. Otolaryngology HNS 2008:138(1) 8-12.